Hua Hin is the first ever seaside resort of Thailand after King Rama VII built a “Far From Worries Palace” here in the 1920s to get away from the stifling heat of Bangkok three hours north. With this royal backing and the construction of the state railway, Hua Hin has grown to become a weekend escape of well-off Thais, well-heeled expatriates and sun-seeking retirees who have flocked to Hua Hin’s beautiful beaches, clear jade waters and cosmopolitan city complete with fully-functioning public services and a wide choice of Hua Hin accommodation to decide where to stay in Hua Hin for a night or more. Hua Hin is your quintessential Thailand beach destination without the ubiquitous go-go bars, all-out partying and forests of beachside hotels in Hua Hin Thailand that have defined many other seaside destinations, thanks to its proximity to the royal palace and the local authorities and residents’ efforts to reign in the otherwise runaway over-development that has blighted Thailand’s other popular tourist magnets. 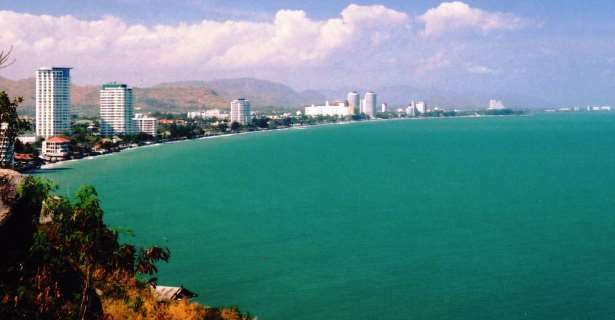 Favoured by middle- and upper-class Thais and wealthy expatriates, Hua Hin has achieved that liveable balance between being a fair seaside resort, a well-run city with all imaginable convenience and comfort within easy access, and a thriving community of international citizens contributing to the already colorful local scene. Hua Hin’s cosmopolitan image may initially scare off baht-minded independent travelers looking for cheap hotels in Hua Hin, but there is in fact plenty of guesthouses and affordable accommodation in Hua Hin if you know where to look; an occasional Hua Hin boutique hotel often hides behind thick beach foliage. Take in the commanding view of the resort from a Buddhist monastery atop Takiap Hill four kilometres from town. Then there’s the pleasantly bustling night street market where you can dig into an abundance of prawns and fish cooked fresh, or shop for HuaHin’s distinctive “khommaphat” or hand woven printed cotton and other trinkets for sale, and witness how local Thais normally go about their daily life. Less crowded beaches await at Suan Son Pradiphat and Khao Tao, the former an Army Welfare Office beach eight kilometres south and the latter a traditional fishing village five kilometres away. As an aristocrat resort town, Hua Hin has become popular in Thailand as a premier golfing destination. The presence of country clubs means you can pamper yourself not only in a luxurious spa and Hua Hin beach resort but also stay in the best hotels in Hua Hin and rub elbows with the high society. While in Hua Hin, collect useful skills that will make you popular back home. Kick like a Muay Thai boxer or cook “tom yum kung” or “phat Thai” like a native; the best hotels and resorts in Hua Hin usually has courses of varying length, so ask around. You can even sign up with the Institute of the Healing Arts and learn how to knead muscles the Thai way. Still, the most popular tourist activity is offshore – fishing, scuba diving, snorkelling, kite-boarding are old standbys and just a few perennial favourites. Further explore the Gulf of Thailand and stretch your sea legs on a cruise aboard a teak wood boat regularly picking up passengers headed to Sam Roi Yod National Park. There, you can feed the resident monkeys, join an eco-cruise or ride the elephants, and watch dolphins get playful on the way back.